Este libro me hizo una mueca en una de mis visitas a la libreria. Solo vasto que lo viera por unos segundos para que sus ilustraciones me atraparan. "The story of Frog Belly Rat Bone" es el extraordinario trabajo de Timothy Basil. La historia nos narra como un niño crea a un personaje echo de alambre y calcetines viejos y junto con el transforman lo que era "La tierra del Cemento" un lugar gris y lleno de desperdicios en un paraiso... Este libro es una maravilla! This book winked at me in the bookstore. 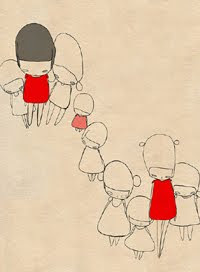 I took just a couple of seconds for me to fall for the illustrations inside it. 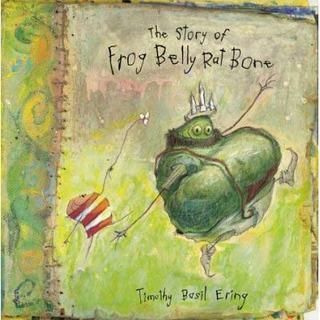 "The story of Frog Belly Rat Bone" is the extraordinary work of Timothy Basil. The story is about a boy (a round-headed, neckless stick figure) who builds a creature from wire; wet, smelly socks; and other things at hand, together they will transform "Cementland" a dull, gray, endless place of ruined buildings, exposed plumbing, and things in corners that nobody really wants to see, into a paradise... This book is great!